Milos has been untouchable on serve. 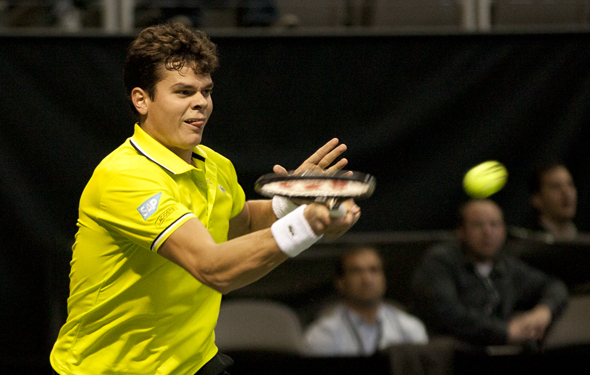 FROM THE SAP OPEN IS SAN JOSE – Ryan Harrison had a couple of very small chances to defeat the service bombing Milos Raonic is his 7-6 (4), 6-2 defeat to the Canadian on Saturday in the semifinals. The first came in the tiebreak, after he had fought Raonic tooth and nail in the first 12 games and had put up impressive service statistics of his own. But, he missed a forehand to start the breaker, saw Raonic crush a 142-mph ace, a service winner and then curl a forehand down the line pass to go ahead 4-0. The 19-year-old American did manage to fight back to 4-5, but then Raonic placed in another ace down the tee and forced Harrison into a backhand error.